Learning Effortlessly in No Time Like Crazy Driving your Car, Horror & Romantic Stories. 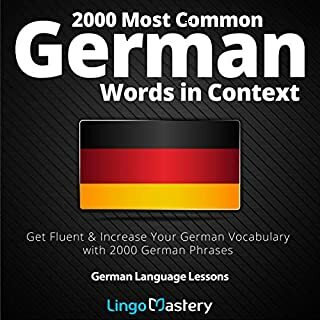 Language Lessons Audiobook. Italian Narrator. 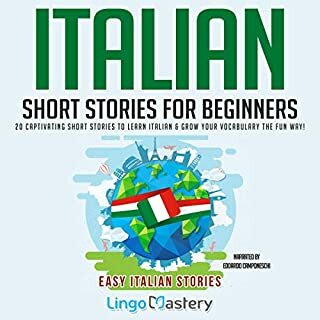 Learn Italian with horror and romance stories effortlessly! In the audiobook you will find three horror stories and two romance stories. Before every story, we will analyse specific words and expressions, so they will already sound familiar to you while listening to each tale. I will reveal some information in advance, to help you understand better everything that happens in the narrative. The sequence of the stories is intended to become more difficult as you proceed, starting from the easiest level; therefore, you should follow the preset order. 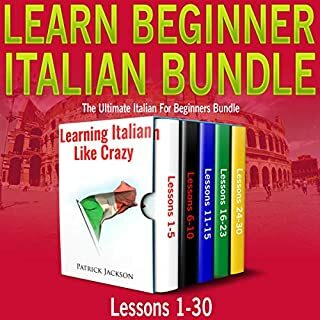 A well-known American language instructor and his native Italian assistants teach you to speak and understand the true building blocks of real Italian. Welcome to level two. Did you know that - according to an important study - learning the top 2000 most frequently used words will enable you to understand up to 84 percent of all non-fiction and 86.1 percent of fiction literature and 92.7 percent of oral speech? Those are amazing stats, and this audiobook will take you even further than those numbers! Don’t look any further, we’ve got what you need right here! In fact, we’re ready to turn you into a Italian speaker…are you ready to get involved in becoming one? This is definitely the best way I've ever tried to learn a new language. Never thought of trying it thew audio book before. A useful tool to learn a new language. With the use of this book the listener can increase their ability to speak this language. The Narrator does a good job in helping the listener be comfortable with the language. Learning Italian was one of my goals for this year, and for the early part it didn't seem like It was going to happen. I recently got this audio book, and I am confident of achieving this goal now. 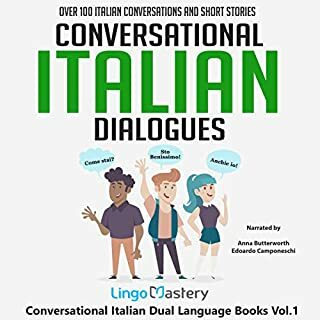 This book introduces many common words in a typical conversation in Italian, and it has broadened my vocabulary and comfort with using these words in the right context. This is indeed a great way to speed up the learning process. 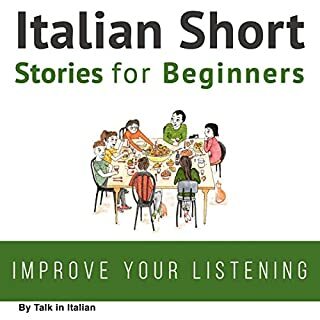 What is really helpful for my studies of Italian and maybe also others, is to have the Audible playing while I follow along on the visual Kindle book. To hear and see at the same time has been helpful. this language book is much better than most that you will find. usually, it is just dumb sentences you will never use. the speaker sounds like a natural Italian speaker, not some English guy trying to speak with a forced accent. my only complaint would be to say the sentence in English first, then repeat the Italian. I will recommend this. look forward to more from this author/publisher. This book is all about learning Italian. I haven't become fluent yet but I'm working on it (as well as a few other languages) and this book is truly a wonderful way to learn. I love hearing the words and phrases said by a fluent Italian speaker and then to hear the English really helps for the learning to stick, at least for me. The narration is done well. Edoardo Camponeschi has a lovely voice and a clean and clear speaking narrator. He says the word and phrase slowly so you can follow along easily then says it at normal speaking speed. Overall, Lingo Mastery brings us another language book to help expand our minds and talents in an interesting and fun way. 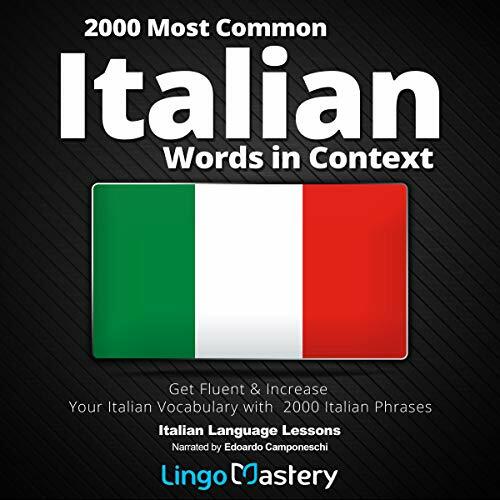 If you're looking to learn Italian then you need to pick up this book and start learning! I'll start off by saying I've always wanted to learn Italian. When I was a child, I always got inexplicably happy whenever I got to go to my grandparent's house---hearing my grandpa singing loudly in Italian while making Sunday supper always put a smile on my face. I always meant to ask them to teach me, but life kept us apart most of the time and before I knew it; they both passed. After seeing this audiobook pop up , I finally decided to take the plunge and dedicate some real time into learning it. Although I'm still struggling, and I need other materials as well, this Lingo Mastery book definitely has helped me. Although I have been given a free review copy of this audiobook, it has in no way affected my review. Great resource for learning Italian. I recently got interested in learning new languages, and I have found audiobooks to be more effective. This book has helped me improve in my understanding of the italian language, its word usage and meanings. I mostly enjoy the examples in English and Italian, as it helps me to relate with each word usage. Excellent book. 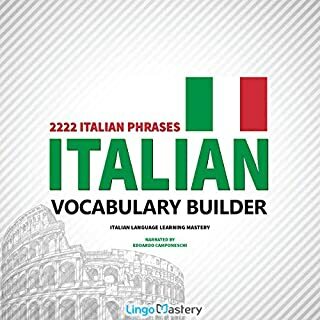 An interesting tool to help you with your Italian. The instructor is intriguing and interesting has a great accent. So, if you're interested in learning a few new Italian words and phrases, pick up a copy and enjoy.